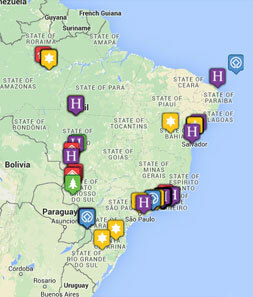 Tribes Overall: "We saw a great deal of Brazil in just under 3 weeks. More to the point, we traveled where we wanted to go with a tailor made holiday emphasizing wilderness and nature. Because the communication with Tribes, and Guy in particular, was so exceptional, we had a very good idea of what to expect. There were no surprises. That being said, knowing what's in store is one thing - experiencing it is quite another. From start to finish, this was an extraordinary, exhilarating and exceptional experience." Tribes Service: "From the start, it was clear that Tribes was what we were looking for. We wanted a company to help us plan an adventure around the specific things we wanted to see. Sounds easy enough, but in doing the research (I'm a research maniac) I found few companies knew of some of the locations we were interested in, let alone how to book us there, or they wouldn't book us because they didn't have a contract with those providers. To say Guy was knowledgeable and helpful about Brazil would be a serious understatement. It was evident from our first communication that Tribes was what we had been looking for. We started planning immediately, without concern that they're based in Britain and we're in the US. Every question we had was answered, usually before we knew enough to ask it. Because of Guy's consistent, clear communication and vast experience, he put together a tailor made vacation for us that, honestly, no one else could do. There was no detail that was not explained. His suggestions were well taken and resulted in seeing more of the country than we thought possible. Absolutely stellar service from the very first email." Social & Environmental Responsibility: "What I appreciate about Tribes is that they explained to us how the areas we were at were helping to benefit the environment. Nowhere was this more true than at Southwild Flotel. We received a great deal of information from researchers who stay there to study the jaguars (and from our guide Kiki) on efforts to conserve the jaguars and how stabilizing their population effects the local ranching community. In Rio, we had a private guide take us to Santa Marta favela. What struck me is how beautiful it all was: the strong sense of community, the colors and the art on the walls, the music coming from the kids learning to play various instruments, the breathtaking view of Rio, and of course the generosity of the people living there who allowed us to essentially climb over their rooftops and across narrow, winding steps visiting in the first place. I guess beauty is in the eye of the beholder, and maybe so is wealth. " KiKi was our guide at Southwild Flotel in the Pantanal. Born in Ecuador, he was the GM of the Lima Peru zoo for 12 years and has been with Southwild for the past 4 years. We were very fortunate to meet this man and spend 5 days with him. His knowledge of the the Pantanal inhabitants is so vast (genus, species) I don't know how he can possibly keep all this information in his head. Watching him "read" the environment every morning and afternoon was fascinating - and productive - as he would inevitably find a well hidden monkey or, of all things, a stingray. He was always ensuring we had enough water, and were comfortable, and always offered extra assistance at every opportunity. We recapped our adventures at meal times, enjoying interesting conversations and some very good laughs. KiKi was a tremendous guide and a wonderful person. "Memory not to be forgotten? Undoubtably, meeting Ms. Silvia. Despite the obvious language barrier, the Brazilian people were accommodating and friendly toward us throughout our travels. Enter Silvia. From behind the vegetation something was rustling, and we sat quietly, in our little boat supplied by Southwild Flotel, staring at the riverbank, waiting. We were told there was a good chance we would see jaguars, but nothing can be guaranteed in the wild, of course. The foliage began to part and separate. Those stunning black and brown rosettes were there, moving, all muscle, her magnificent coat striking the way it stood out against the green. And then there she was. Just looking at us. Silvia, out for a leisurely stroll. Simply passing by long enough to say hello."